Learn more about author Brian Puerling. Check out his Author Spotlight feature here. Brian Puerling, MS, NBCT, a graduate of the Erikson Institute and a National Board Certified Teacher is currently the Director of Education Technology at Catherine Cook School in Chicago, Brian is also a former teacher, teacher coach, curriculum reviewer, and as a presenter and consultant for the Chicago Public Schools, the Early Childhood Council of New Zealand, United Way Miami-Dade, and NBCUniversal. Puerling currently serves on the Nickelodeon Curriculum and Content Advisory Board and is a former participant on the Sesame Workshop Teacher Council. He was an early career fellow for the Fred Rogers Center, and was a recipient of the PBS Innovative Educator Award and PBS Teacher’s Choice Award. 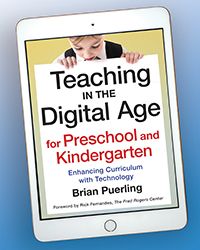 Teaching in the Digital Age for Preschool and Kindergarten guides teachers toward integrating technology across the curriculum so it can have an authentic, meaningful, and developmentally appropriate impact on children’s exploration and learning. 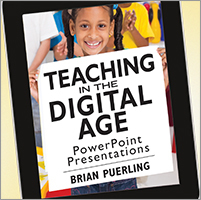 Full of strategies and stories, photographs and videos, this book provides a clear picture of integrating technology that will expand awareness and ignite the teacher’s excitement. 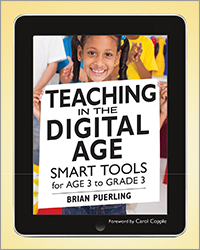 The book Teaching in the Digital Age provides a framework for integrating technology and interactive media tools into the classroom. This CD-ROM—perfect to use with pre-service and in-service educators—includes eight PowerPoint presentations complementing the strategies in the book. A facilitator's guide is included as a PDF. CD-ROM. Technology is rapidly changing the ways we live our lives and interact with the world. It's also changing how you teach. Technology can enhance your classroom's complete curriculum and assessment and help you create and capture meaningful experiences, support inquiry, and expand your classroom's walls. Teaching in the Digital Age is a comprehensive framework that will help you select and use a variety of technology and interactive media tools in your classroom—including digital cameras, audio recorders, webcams, publication and presentation tools, and multi-touch mobile devices.